Yesterday we saw an update to Drafts and Tumblr. Yet, it wasn't until today we learned that the latest version of Tumblr for iOS has supported x-callback-url specifications. Greg Pierce immediately wrote a couple of URL actions as a sample that you can install and tweak with. After looking at the URL schemes documentation for Tumblr, I decided to try writing a custom URL action that would allow me to easily post a link from Chrome to Tumblr. As you would expect from a link post, you will need three data from the web page you're linking to: the page title, the page URL, and a quote from the page. 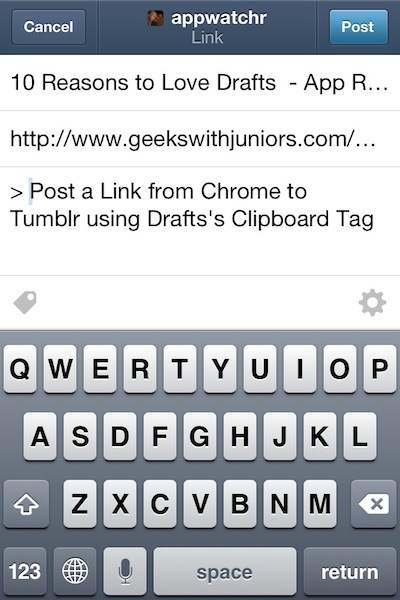 Upon receiving the URL request, Tumblr app will prompt you to make any final modifications before submitting the post. The page title will become the post title, the page URL will become the post body, and the quotation that I put in the clipboard will be set up as a Markdown-formatted post in my Tumblr post. When this action is invoked, the Tumblr app will prompt you to make final adjustments to your post, including additional thoughts that you might want to add underneath the quotation. And, when you're ready to post it, Tumblr will redirect you back to Chrome. My first impression about the new Tumblr's x-callback-url features is how easy it has enabled me to post my thoughts to Tumblr without having to start from the dashboard. I believe this particular action is one of the easiest way to post a link to your Tumblr blog. Simply select the part that you want to quote, put it in the clipboard, hit the bookmarklet, and you're ready to add your thoughts in Tumblr. Hit post, and you're back to Chrome.